Americans are gobbling up more organic fruits and vegetables than ever before, from organic blueberries and organic apples to organic packaged greens and cut-up organic vegetables ready for their children’s lunch box or their family’s dinner plate. Over half of all households in the United States now purchase organic produce. The sale of organic bananas alone—now a $165 million market—soared by more than 30 percent last year. Organic “value-added” vegetables (think chopped kale, peeled carrots and ready-to-cook squash) grew by a whopping 54 percent in 2015 to almost $150 million. “The organic produce market is growing and strong, and it is driving trends in produce innovation across the board,” said Laura Batcha, executive director and CEO of the Organic Trade Association on Thursday at the first-ever Organic Produce Summit held in Monterey, California. The inaugural sold-out event on July 13 and 14 attracted more than 500 attendees representing every facet of the organic produce industry, and included a trade show with more than 70 exhibits from leading organic fresh fruit and vegetable producers. The event showcased the booming $13 billion organic fresh produce marketplace with a series of educational sessions hosted by OTA, and featured key industry speakers and networking opportunities. Digging deep into the produce aisle, Batcha gave a State of the Organic Produce presentation on Thursday, unveiling the findings of a report on the produce-buying habits of Americans compiled for the Organic Trade Association by Nielsen, the global information and measurement company. According to the OTA 2016 Organic Industry Survey released in May, fresh organic produce sales in the U.S. reached $13 billion in 2015. (Total sales of organic fruits and vegetables, including fresh, frozen and canned, amounted to $14.4 billion.) The $13-billion market includes $5.7 billion worth of organic produce sold in the mass market (supermarkets, big-box stores, warehouse clubs), $4.7 billion sold by specialty and natural retailers, and $2.7 billion in direct sales (farmers’ markets, CSAs, online). Nielsen measures organic sales primarily from the mass market, and puts organic produce sales at $5.5 billion. 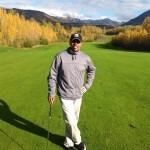 The Nielsen figures do not include specialty and natural retailers, nor direct sales. Further, Nielsen’s data reflect grocery coding systems, which are based on retailer description and in which organic can be under-represented. The Nielsen figures, however, delve down to the specific types of organic vegetable or organic fruit sold, providing detailed information on the buying habits of consumers in the major category of supermarkets and big-box stores. Since 2011, the sales of produce in this country have increased over 25 percent. Convenience, a greater awareness of the health benefits of produce, and an increased interest in local food sources largely contributed to the increase. And driven by the desire to improve upon already healthy food choices, organic fruit sales have soared 123 percent during that time, while organic vegetable sales have jumped by 92 percent. Organic bananas: Sales up a solid 33 percent from a year ago. Organic blackberries: Sales up a sharp 61 percent from a year ago. Organic salad greens and organic baby carrots: Sales of each up 11 percent versus a year ago. Organic Pink Lady Apples: Sales almost double (up 96 percent) that of a year ago. The U.S. organic industry saw its largest dollar gain ever in 2015, adding $4.2 billion in sales. 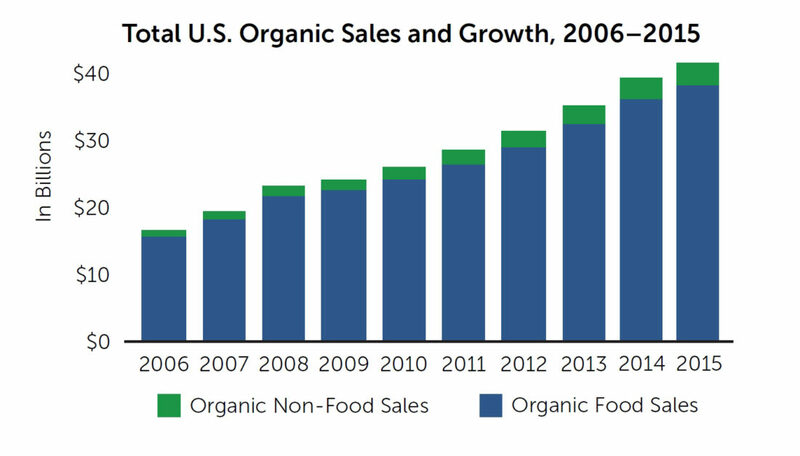 Total organic food sales in the U.S. were $39.7 billion, up 11 percent from the previous year. Organic produce sales accounted for 36 percent of the organic market. Almost 13 percent of all the produce sold in the United States now is organic. The Nielsen findings showed that today’s organic produce shopper tends to be more kid-focused than the average produce shopper, and that the huge majority of these enthusiastic organic produce buyers—77 percent—are going to their favorite grocery store or supermarket chain to buy their organic fruits and vegetables. The findings bear important insights for retailers looking to draw more shoppers to the fresh produce section, as the booming demand for organic produce will spill over into purchases of conventional produce, said Batcha. To download an infographic on the State of Organic Produce, visit the Market Analysissection of the Organic Trade Association’s website.